My first skiing/snowboarding trip in two years brought me to the little village of Aschau located in the Zillertal in the Austrian Alps. I planned to spend five days with my buddies Volker, Rainer and Daniel on this beautiful area of the mountains in order to make some use of the tons of snow middle Europe had received during the winter so far. Due to some family- and work-related complications, I arrived on Sunday night, a day after the others, but luckily when my train pulled into the station of Jenbach, Daniel was still sober enough to come pick me up and drive me to Aschau located 30 minutes away. After a fun Monday of snowboarding in almost ideal conditions (the weather was perfect and the snow was nice too on the higher slopes of the mountain) at the ski resort of Zell, we returned to the same place on Tuesday. This time I brought my camera because on the previous day I had done a little bit of reconnaisance of the area and identified a couple of summits that I could reach fairly easily while on the slopes. The Zell resort is connected with two other ski resorts by the name of Hohenfuegen and Koenigsleiten. The entire resort is huge and if one wants to ski the slopes the furthest away, one has to spend half the day getting there and then another half of day to return to ones point of departure. We therefore took a variety of lifts and while going up one lift in the Koenigsleiten part of the resort I noticed a summit cross very near to were the chair lift would drop us off. From the map I could see that I was eyeing the Koenigsleitenspitze and declared it a worthy destination for my first summit in 2011. I tried to share my enthusiams with the others, but the did not really see the fun in taking off their skis and then climbing up the 50 meters or so to the summit. Luckily I was snowboarding and could walk normally after detaching the snowboard from my boots (I must admit that hiking up that slope in the cumbersome and hard to walk in skiing boots would have been fairly tricky. 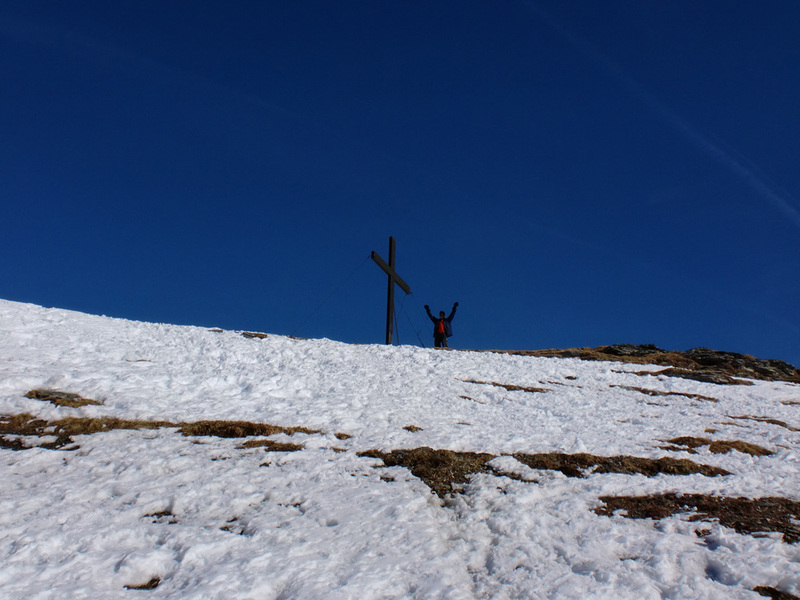 So they stayed below and took a picture of me near the cross before skiing down the mountain to meet up with me again later that day. There was only two more people at the summit, a couple, and upon asking whether they could take my picture, they gladly did so and then began to name some of the impressive looking summits that I was seeing all around me. Interestingly, I could see the two highest mountains in Austria, the Grossglockner and the Grossvenediger. I only spent a total of maybe 5 minutes at the summit, before hiking down to the slopes strapping the board back on and trying to catch up with my buddies. A few hours later, I pretty much repeated the same scene on a nearby lower mountain called Plattenkogel. Again we had taken a chair lift from which I had seen some structure on the summit. I took of on my own to find on the summit couple of signs, a memorial and a little bit further down (not really on the summit, but more visible from the valley floor) a summit cross. I shot a few pictures and then snowboarded down from the summit to find Volker a little bit further below. The friendly fellow he his, he had waited for me patiently, and I sat down next to him in the snow because now it was our turn to wait for the two others, who had decided to use the time for one more run. Two easy summits in a day. Not bad. I "cheated" somewhat going up and therefore the accomplishments is not so impressive in terms of effort, but certainly very cool in terms of the scenery. Just look at the pictures.